In case you missed it, the new Mac Pro is in the Macworld Lab, and we have our first set of test results. Our tests of a $6799 configure-to-order (CTO) Mac Pro show—as expected—that the new system is better suited to folks making their living using professional apps like Final Cut Pro than everyday users working in consumer apps like iMovie. 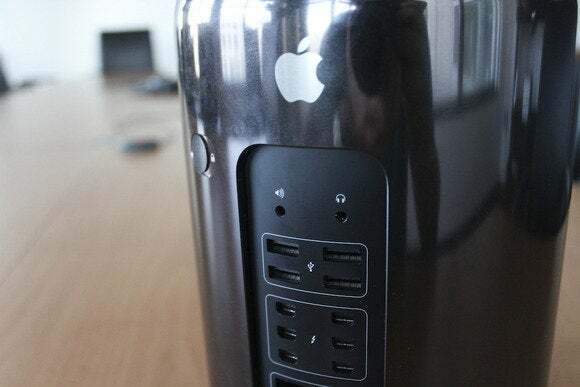 The new Mac Pro comes in two standard configurations. The entry-level $2999 model features a 3.7GHz quad-core Xeon E5 processor, 256GB of PCIe-connected flash storage, 12GB of RAM, and dual AMD FirePro D300 graphics cards with 2GB of video memory each. The stock $3999 model has a 6-core Xeon E5 processor running at 3.5GHz, 256GB of flash storage, 16GB of RAM, and dual AMD FirePro D500 graphics with 3GB of video memory each. We tested a Mac Pro provided by Apple that was customized to use an 8-core 3.0GHz Xeon E5 processor, 512GB of flash storage, 32GB of RAM, and dual AMD FirePro D700 graphics with 6GB of video memory for each card. As points of comparison for the 8-core Mac Pro that we tested, we looked at the results from two 2012 Mac Pros, a CTO 27-inch 2013 iMac, and a late 2013 15-inch Retina MacBook Pro. We ran an updated version of our overall system performance test suite, Speedmark, which is now at version 9. It should be no surprise that the new 8-core Mac Pro is the fastest Mac we’ve tested, but it was only 8 percent faster overall than our previous champ, a CTO 2013 27-inch iMac. That custom system has a speedy quad-core 3.5GHz Core i7 processor, a 3TB Fusion Drive, 8GB of RAM, and Nvidia GeForce GTX 780M graphics. The new Mac Pro was 63 percent faster overall than the 2012 12-core 2.4GHz Mac Pro, and nearly twice as fast overall as the 2012 3.2GHz quad-core Mac Pro. The 13 individual test results that make up Speedmark show that the new Mac Pro really shined in processor-intensive tests like HandBrake encoding, the Cinebench CPU benchmark, MathematicaMark and Photoshop. The new Mac Pro did well on graphics tests, especially compared to the older Mac Pros, but the 27-inch iMac’s Nvidia GeForce GTX 780M with 4GB of RAM performed a bit better in one test (Cinebench’s GPU benchmark) than the workstation-class D700 graphics in the new Mac Pro. The strangest result was our iMovie test that uses some iPhone 5s slo-mo video footage. We use iMovie’s Enhance feature and exported as a 720p movie. The new Mac Pro was the fastest Mac Pro in that test, but at 170 seconds, it lagged well behind the Retina MacBook Pro’s 63-second result and the CTO iMac’s very impressive 47-second time. Update: As was pointed out to us by a couple of astute Macworld readers, the reason for the performance difference lies with Intel’s Quick Sync Video technology. Both the iMac and MacBook Pro use Intel Core processors that include Intel Quick Sync Video’s hardware acceleration support. The Xeon processors in the new Mac Pro do not. Apple’s iMovie application takes advantage of Quick Sync Video to speed up video processing, which explains why those two Macs perform so much better on this one test than the new Mac Pro. We also ran another Photoshop test, one that uses only features that take advantage of the GPU. The new Mac Pro with its dual graphics finished this test in 162 seconds, 37 percent faster than the 2012 12-core Mac Pro, 48 percent faster than the 4-core Mac Pro from last year, 30 percent faster than our CTO 2013 iMac, and 17 percent faster than a high-end 15-inch Retina MacBook Pro. Results are times. Lower results are better. Best result in bold. Reference models in italics. Apple updated its professional video editing application, Final Cut Pro X, to take advantage of the new Mac Pro hardware. To see how well the computer handles 4K video, we turned off background processing and timed how long it took to import 60 seconds worth of 3840-by-2086 clips into a 4K project, apply a couple of filters, and balance the color of the clips. Importing took around 131 seconds on the 2012 quad-core Mac Pro, but just under 16 seconds on the new Mac Pro. That was about one-third the time it took to for the 2013 CTO iMac with Fusion Drive to import the footage. The Retina MacBook Pro, with its speedy PCIe connected flash, imported the footage in an impressive time, but the new Mac Pro was still 23 percent faster. Rendering the project after applying the effects and analyzing the color took 80 seconds on that Retina MacBook Pro, but just under 40 seconds on the new Mac Pro. Check back soon for our full review of the new Mac Pro. Have some tests you’d like us to run? Let us know in the comments. Editor's note: Updated at 10:20 a.m. PT on 12/23/13 with an explanation of the Mac Pro's iMovie performance.